Are there really only 24 hours in a day?? After years of dreaming and a few months of mad planning, it's come down to the final month before we leave for our PCT thru-hike. Many friends have asked what we are doing to prepare, so let me explain. Some days it feels like a logistical circus, with so many balls in the air at once. First, consider that we both work full time, and are scheduled to work through this entire month, with just 1 day off at home before leaving town for good. Our jobs can be intense and demand long hours, though we do at least have 4-day "work weeks". On top of scheduled hours, I also get called in at odd hours (weekends, midnight, or just as I'm heading off to bed) several times a month, and sometimes more frequently. All of this means that our trip prep has to be squeezed into late nights or be left to our weekend days. To make things a little more interesting, we've decided to go forward with a long-planned remodel while we are away. This means that we have to move out of our house before leaving for the hike. And of course, we'll have to have everything lined up for the construction project before we head out into the wilderness, where we will be incommunicado for days at a time. Thanks to email ordering, online bill pay, and a fantastic on-site team, we're confident the project will go smoothly in our absence if we can manage to sort out a few dozen more details before we go. The basic gist is that there are a ton of things to do before we can leave, with very few free hours to spend on getting them done. Fortunately, there are two of us, and we are equally committed to the four major things going on in our lives right now (work, construction, moving, PCT). We've been chipping away at tasks from our own mental lists over the past 8 weeks. Now that we've reached the home stretch, we caved and hung a giant paper list in the middle of our house. There are columns for construction, moving, and PCT - we are constantly adding new tasks with a Sharpie marker and crossing off others as they get completed. Our house is littered with half-filled boxes as we pack belongings we don't expect to need in the coming weeks. We've taken several small loads to a self-storage facility, and other boxes are earmarked to go with the movers who will come in 2 weeks (!!) to take all of our furniture, wall-hangings, contents of the kitchen, books, and anything else that we won't need access to until our house is ready. As we pack we have also edited the contents of our house, generating several bags for donation to the library and local thrift store. 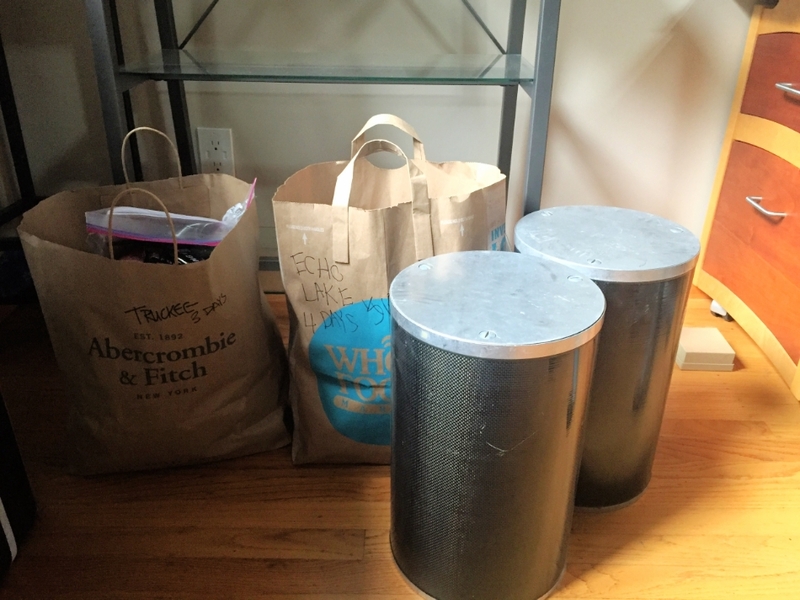 We've passed along larger items to friends, neighbors (via NextDoor), and strangers (via CraigsList Free) and made use of our construction debris bin to get rid of items that have outlived their usefulness. It's amazing how much STUFF even two fairly minimalist people can acquire over the years, especially in a house with no garage, basement, or attic. I'm pretty sure that when we return from hiking it will still feel like we have more than we need. We took 10 resupply boxes to my parents' place the weekend before Memorial Day - 9 that they will mail to us on the trail and one for us to pick up when we stay with them (they live near Chester, which is about the half-way point on the PCT). That leaves another ~10 resupplies to put together. We assembled the Tuolumne resupply last weekend for delivery to Hillair & Michael, friends from my ceramics studio who have generously offered to meet us at the backpacker campground. Yesterday I took the Independence/Kearsarge and Kennedy Meadows South resupplies to Cynthia, a dear friend who is going to make a road trip out of these two distant (but important) east-side resupply points. Since we'll be hiking through the Sierra well after Labor Day, many of the usual resupply points will be closed and rides from east-side trailheads may be difficult to find. Knowing we'll have friends waiting for us at these spots means a guaranteed ride to town (Independence) and back, and an easy way to offload our bear canisters once we've left the mountains (Kennedy Meadows). The Tuolumne & Independence resupplies were each tested in our bear canisters to ensure all of the food would fit (if barely) - we don't waste one inch of space in them, as calories are precious in those long mountain stretches. Next, we made the Donner Pass/Truckee and Echo Lake resupplies, which we'll deliver to friends Bryan & Becky who live in Truckee. We'll see them in a few weekends and will leave the bear canisters with them to pick up when we come through Donner Pass. Bryan plans to hike with us to Echo Lake, where Becky will pick him up and bring our next resupply. We also recently found friends who have a place at Echo Lake and offered to let us stay (& shower!) there as we pass through. We've been floored by the generosity of friends, acquaintances, and near-strangers as we have been planning this trip. We almost forgot! Food for the initial leg of our trip, before our first resupply. The final few resupplies we'll take with us when we leave town July 1. One we'll deliver to my sister Julie, who lives in Riverside and will meet us in Idyllwild as we pass through. Three we'll take on the train to Seattle and leave with Andrew's siblings, who have generously offered to meet us at various highway crossings throughout the state of WA. And one is the food we'll start with in our packs -- which we completely forgot about until last weekend, because it wasn't listed as a "resupply" point on our planning spreadsheet! This set off a flurry of cooking and dehydrating, as we suddenly needed 9 more dinners. Andrew made Mexican Minestrone (x3) and Drunken Noodles (x3) on his day off and a batch of Thai Red Curry with Flattened Rice (x3) one night after work. They've been vacuum sealed and we re-distributed some of the meals in other resupplies so we wouldn't have repeated meals too close together. We're also hoping to pick up some more Somersaults, a crunchy snack that's long been a favorite for our backcountry trips. The company is local, and we were stoked to hear that they would donate a few cases to our thru-hike! Since so many of our resupplies will be hand-delivered, we purchased fuel canisters for each (it's tricky to send these by mail), and we also included items such as maps, guidebook pages, a bit of cash, replacement pens, NYT crosswords, batteries (headlamps, GPS), spare ziplock bags, and toiletries. When we're with friends or in towns, we'll only have to shower and do laundry and will otherwise be free to enjoy our off-trail time with them. Last weekend we took all of our house plants over to Jen's place. It was so peaceful in her garden which is perfectly cared for with many happy plants, a huge contrast to our jungle of a yard which has been neglected in anticipation of our construction and absence. The outdoor orchids and succulents went to the courtyard of my ceramics studio. There is always rinse water from the clay sink that needs to be dumped, and the climate in Sausalito is perfect for these plants. Of course, half of them tipped over in my car on the way there so I had to vacuum out a ton of soil when I got home (add it to the list). Our neighbors kindly agreed to take a handful of large shade-loving potted plants that would otherwise be difficult to transport, so I wheelbarrowed them up the driveway and across the street to their temporary locale. 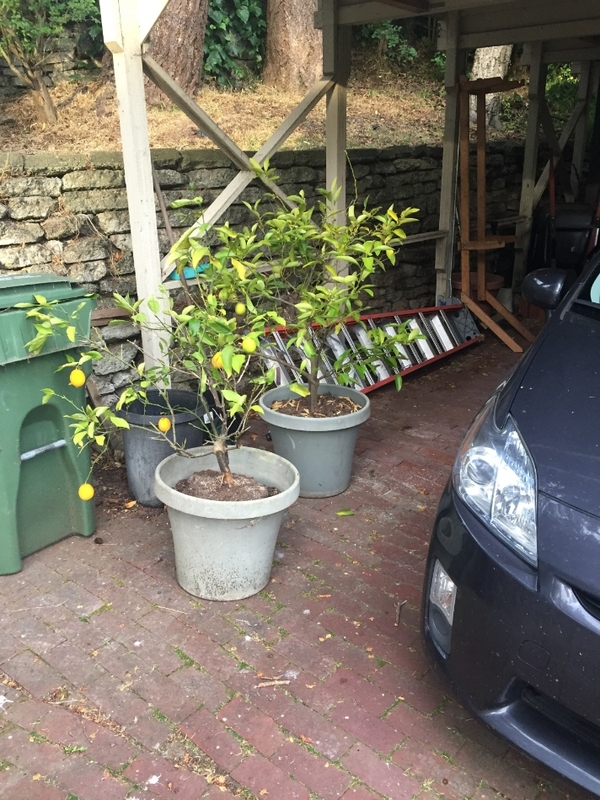 And two smallish container citrus trees went to Cynthia's sunny deck across town (fortunately in an open-top vehicle rather than my Prius). Finally, Emily will stop by our house every few weeks to water two young Japanese Maples, our beloved blueberry patch, and the Meyer Lemon & fig trees. Everything else will have to fend for itself amidst the construction and complete lack of water or care, and we'll deal with it when we return. Nigel is the primary supervisor of packing and resupply prep. He is less interested in the demolition phase of our remodel, which is currently happening just below the living room floor. Our cat Nigel had planned to vacation with friends during our hike, but during a trial stay a few weekends back the resident cats had a different idea. So we've been scrambling to find an alternate option and he spent this past week with another friend. We were elated when he returned Friday morning with a good report, and an offer of lodging there for the entire time we are away! He has one more trial vacay arranged, and if that works out we'll have a backup option. He's our only creature at the moment and means the world to us, so it is super important to know he will be happy and well-cared for while we are away. Oh, and speaking of pets... We heard from my parents this week that Calvin, their Labrador Retriever (who I rescued and foisted on them), broke into the guest room while they were out of town and ate half of our Wrightwood resupply box. So we will put together some replacement food and ship it up their way. Here's hoping the boxes are better secured as it will be more difficult to replace losses once we are on-trail. But this is our last uncommitted weekend home before we leave. Andrew is out of town for a work conference starting mid-week, and next weekend is the Dipsea, our favorite trail race of the year and a big local event that brings out a huge community of runners. The following weekend is the Double Dipsea race. And the movers come. And our "Bon hike-age" party. The last week of the month I have a work conference, and we will both be away all weekend supporting a friend as she runs the Western States 100-mile endurance run. Conveniently, we'll pass right through Truckee to drop off re-supplies and gear with Becky & Bryan. Then we work 3 days, have 1 day off, and head out of town. Somewhere in between all of that we will finalize tile patterns & grout colors, confirm countertop & cabinetry specs, choose the last few lighting fixtures, and meet with a guy who will hopefully build the wood slab bar for our kitchen. And get some sleep. We are really looking forward to being on-trail. Soon.